It's that time of year again and I remembered to bring back a handful of wild medlars from the farm to make this comparison picture. The small ones are wild, the large ones fruit from our cultivar Nottingham. 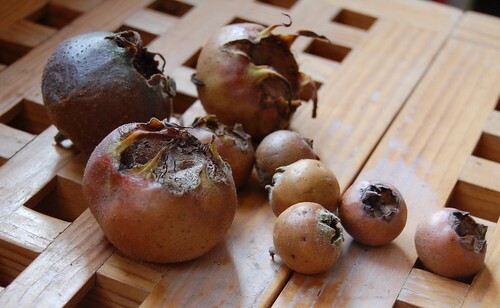 There are several medlar cultivars known but it's hard to source them, most nurseries only carry Nottingham which is prized for its large flowers and fruit. Keepers do list seven varieties. However, it's rumoured that some of the other sorts have a better flavour. Testing the Nottingham against the wild ones I think that could well be the case. The small fruits seemed a little fruitier, more fragrant and with a delicious toffee after taste that I couldn't detect in the larger fruit - or was it just wishful thinking... I still haven't managed to collect enough wild fruit for a pot of jam but I think it could be rather special. Anyway, I have what I have and we always enjoy the jellies and preserves I make with them. This year I'm not in a great mood for cooking so I'm going to stick to the established option of jelly which is quite quick and simple but here are links to all the recipes I've tried in case you're feeling more adventurous.